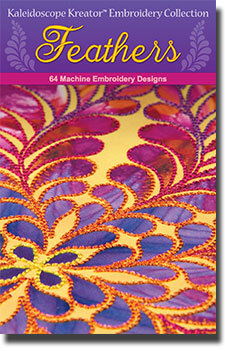 Our kaleidoscope-themed embroidery designs add a stylish flair to any project. Each design in the Feathers Embroidery Collection exactly matches a corresponding shape in our Feathers Template Pack* for Kaleidoscope Kreator 3. By combining designs printed on inkjet fabric with matching machine embroidery, you'll be creating kaleidoscopic works of art that are truly unique! Embroidery designs are available in ART, DST, EXP, HUS, JEF, PES, VIP and VP3 machine formats. Thread chart for each design. Step-by-step instructions describing how to print a kaleidoscope onto fabric using Kaleidoscope Kreator 3 and how to properly align the printed kaleidoscope in your embroidery hoop. A pre-designed sample kaleidoscope image (in four different sizes) that can be printed out and used for practice stitching.